Bring a pot of water to the boil and dip the seaweed in the water for a couple of minutes, then put into a bowl of ice water. 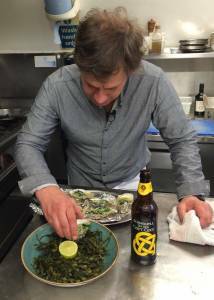 Then drain the water and place the seaweed onto a plate and garnish with half of the lime. Next you need to scrub the oysters to ensure they are clean, then you will need to open the oysters, you will need an oyster shucking knife and a tea towel to do this. Wrap a teatowel over one hand and use it to hold the oyster firmly. Using an oyster shucking knife in the other hand, place the tip of the shucking knife at the base of the hinge, twist the knife using pressure, then, twist the knife to prise the hinge open. Once the oyster is open you will need to cut the oyster away from the shell and drain them. Place the oysters on a tin foil covered tray and heat under the grill for a few minutues. Finely chop the shallots and chives. Melt butter in a pan and add the shallots, Stonewell cider, baby spinach and season with salt and pepper. After a couple of minutes add the cream, chives and fish stock and cook for a further three minutes. Spoon the baby spinch and the sauce onto the oyster and top with grated cheese. Grill for five minutes to allow the cheese to melt and enjoy!